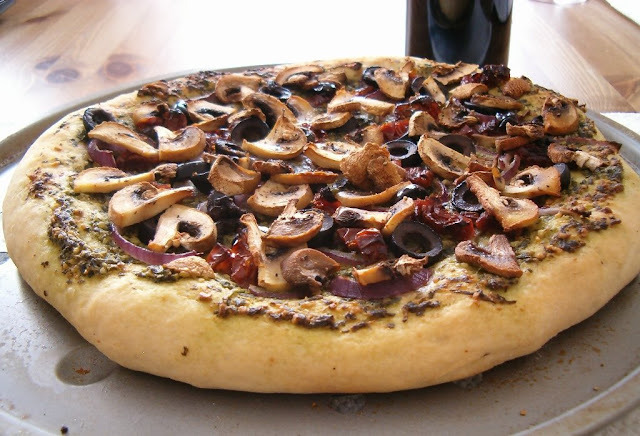 This was a great pizza, thick and fluffy homemade base spread with the Vegan Pesto from Vegan with a Vengeance and topped with sliced mushrooms, red onion, black olives and chopped sun dried tomatoes. Perfect with a glass or two of red wine! Mix the flour and salt in a bowl and set aside. In a large bowl dissolve the sugar into the warm water then sprinkle on the yeast. Leave it for 10 minutes to get all foamy. Add the olive oil and whisk it up. Stir this into the flour with a wooden spoon until it comes together in a ball. Whilst adding some more flour to prevent sticking, knead on a floured surface for 10 minutes, it should be smooth and elastic. Cover and let rise in a warm place for about 1 hour. Punch down knead a couple times, cover and let rest 15 minutes. Now hand pat down or roll out into a circle, however thick you want the base. Keep in mind it will rise some more. Spread with pesto, I used the recipe in Vegan with a Vengeance then top with said toppings and bake in a 200C oven for about 20 minutes or until the crust is golden brown and puffed up.